Itinerary may be taken in reverse, commencing from the Victoria Falls. Our Safari Cruise & Victoria Falls is a delightful journey on Chobe Princess Safariboats, 4 days/ 3 nights and Victoria Falls Safari Club, 3 days/ 2 nights. Arrive in Kasane, Botswana, where you are met and transferred to the Chobe River jetty to begin your Safari Cruise and Victoria Falls journey. The Chobe Princess Safariboats provide the perfect opportunity to take pleasure in the wildlife and bird life of the Chobe National Park. 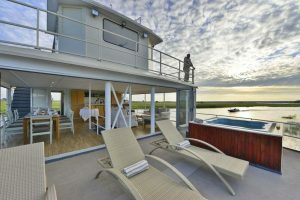 There is something incredibly relaxing about cruising on the Chobe River, along the banks of the Chobe National Park, watching the outstanding wildlife and birdlife from the luxury Safariboats. 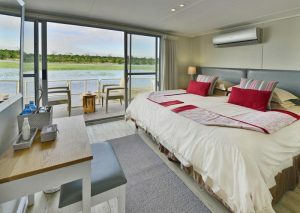 Aboard one of the Safariboats you can cruise over 30 miles of the river and stay overnight in some of the most scenic areas on the Chobe, parking at prime docking sites along the river. Climbing the staircase that connects the accommodation deck to the entertainment deck you will have access to a spacious lounge and bar area that encourages you to take time-out and simply enjoy the view. This deck also has a relaxed open-air dining area where guests can enjoy superb meals prepared by a skillful chef in the full-size on board kitchen. At the front of the entertainment deck, guests can cool off in the plunge pool or simply soak up the African sun on deck chairs while enjoying an ice-cold beverage and the outstanding scenery. The rear of the entertainment deck allows easy access to the smaller tender boats that accompany the boats on all of their travels. These boats ensure that each guest has the freedom to partake in any excursions or activities that are best suited to their own personal needs. Meals and drinks are included. Disembark and transfer across the border to Zimbabwe and the Victoria Falls and on to the Victoria Falls Safari Club for two nights. Guests will enjoy a morning escorted tour of the Victoria Falls and rain forest. Located just four kilometers from the magnificent Falls, the Victoria Falls Safari Club offers personalized, premium service. The new luxury Victoria Falls Safari Club 20-air-conditioned rooms are situated within the magnificent grounds of the Victoria Falls Safari Lodge resort, overlooking a private waterhole. This Club, which offers guests a butler service, looks out over the Zambezi National Park, which is abundant with game, ensuring a brilliant safari experience without having to leave its main deck. Space, style and absolute comfort in fully equipped, conditioned rooms will make your stay completely seamless and ultimately rewarding. Breakfasts included.